Richard Ramos remembers being afraid to start middle school. In his elementary days, he remembered hearing horror stories about his bigger, older peers. "'Oh, they're going to scrub you,'" was the rumor Ramos heard growing up in the East San Fernando Valley. "That's what they called it back then— 'the scrub' is like, 'You get initiated into middle school.'" "None of it ever happened though," Ramos added. "The scrub" turned out to be an urban myth. Ramos is now the principal of Northridge Middle School, making it his job to dispel these urban myths — and to help ease the students' more founded anxieties about transitioning from the familiar classroom structures of elementary school. "Change brings fear," Ramos said, "and it's almost a sense of grieving because you're leaving something behind that you're accustomed to." And this year, Ramos can relate: like more than 200 sixth graders expected to enroll there, he too is new at Northridge Middle School. More than 618,000 students in the Los Angeles Unified School District and in many of the district's independent charter schools are returning to classes Tuesday, kicking off a new academic year in the nation's second-largest school system. The first day of a new school year often means the return of familiar routines. But KPCC is previewing 2017-18 in L.A. Unified by speaking with three educators who are breaking routines or breaking new ground: a charter school leader, a veteran English teacher, and a principal. 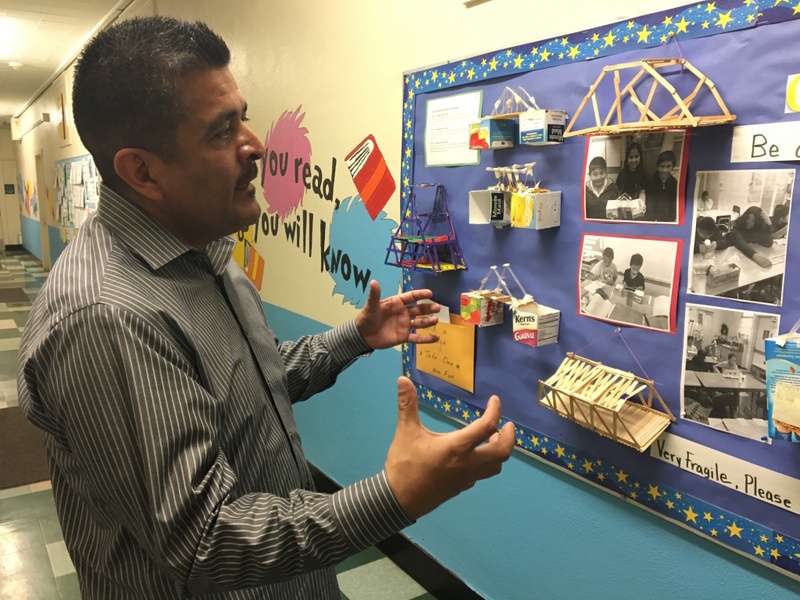 Richard Ramos, principal of Haddon STEAM Academy, shows off students' model bridge-building projects on display in the hallways of the school in Pacoima. He hopes to create a magnet program at Haddon. For the last three years, Richard Ramos poured his heart into Haddon STEAM Elementary in Pacoima. He started a mariachi band and a speech and debate team. He successfully lobbied the school board for the funding to start a magnet program at Haddon; it will open in 2018-19. But when the principal's job at Northridge Middle School opened up over the summer, Ramos was interested. He applied, interviewed and won the job. "I felt like I'm losing something over there [at Haddon], but I'm also gaining something over here," Ramos said. "Everything is going to be okay — I had to tell myself that regularly, and I had to tell [Haddon's] parents that, too." Leading a middle school has personal significance to Ramos. "I lost myself in middle school," he recalled. Eventually, Ramos became involved in gang activity, was arrested for plotting a robbery, and credits a probation program with turning his life around. As an educator for the last 21 years, he's evangelical about schools' power to turn around the lives of students. "Middle school is a very difficult age," Ramos said, "and I truly believe that middle school is like the black hole of education. Kids go in and disappear in there. They may come out physically, but they don't come out ready for high school." And that makes Ramos' efforts to help students feel at home in middle schools critical. As new students arrive, he said, "we're sending that message: 'Hey, we're going to help change your lives here.'" L.A. Unified projects around 45,600 kids will start sixth grade on Tuesday. There were boxes everywhere; evidence of trips to IKEA or the 99 Cent store and of online orders from Amazon. There were boxes at Hattie Mitchell's home, in her car and at the church-owned building that will house the charter school she co-founded this year. Inside them is everything that new school, Crete Academy, might have needed to open its doors for the first time this year — from desks to electrical outlet plates. "It's been really, really interesting and fun," Mitchell said, "but also super chaotic." Charter schools receive public funding, but are mostly operated by non-profit organizations, not traditional school districts. Because of this governance arrangement, founders of new charter schools often must hurdle many obstacles leaders of a new school within a district wouldn't have to face. For instance, charters must recruit students — charters are schools of choice, after all — and must secure suitable facilities without access to the same property tax funding streams as school districts. These challenges seem not to have curbed charters' growth in L.A. Unified so far; there are more charter schools inside its borders than any other U.S. school district. Students dropped their backpacks off on the first day of school at Crete Academy, a new charter targeting homeless students in South L.A. 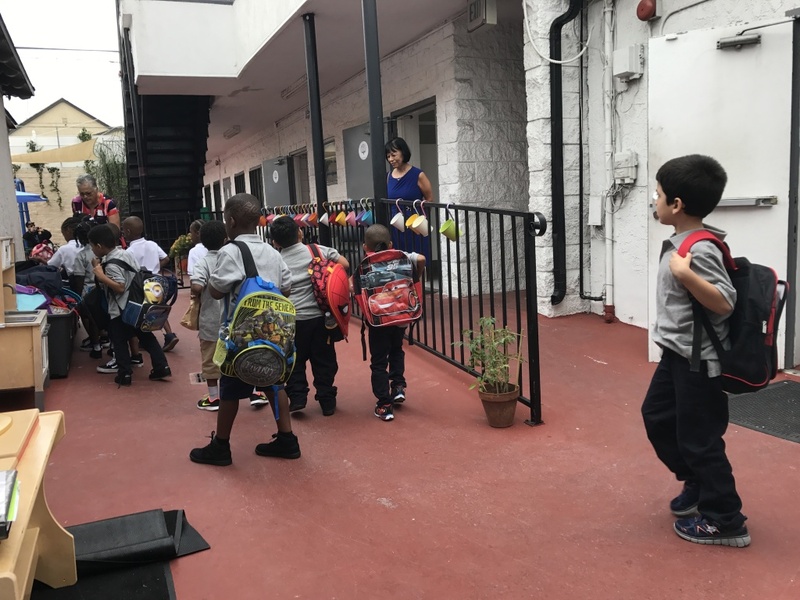 Classes at Crete Academy began on Monday in a building owned by the All Souls Christian Center in the Crenshaw neighborhood. Mitchell first envisioned the school 13 years ago after a fateful trip to Skid Row in downtown Los Angeles. Shaken by an encounter with a homeless child there, Mitchell set about preparing herself to open a school to serve the vulnerable population. 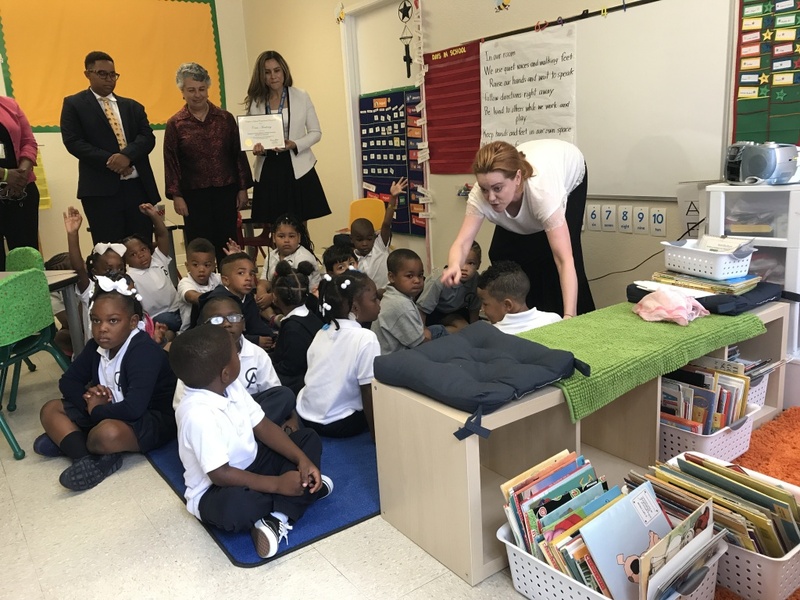 She worked as a teacher and school administrator, interned at the White House and worked in Louisiana's education department — laying the foundation, she says, to open Crete Academy. For the last 18 months, Mitchell and the founding team have been recruiting students, bringing their pitch directly to homeless shelters. "We've lost students along the way," Mitchell said, "some to better situations — they found housing in other cities … and some to not-better circumstances, unfortunately." On Monday, more than 130 students arrived for classes. The school still has room for another 12 enrollments. Some charter school leaders are left guessing about whether students who fill out enrollment forms will actually show up on day one — but Mitchell wasn't surprised. The Crete Academy team has been following up with parents. Her staff made home visits to roughly half of the families who filled out paperwork weeks or months ago — and, in the process, got an idea of who would likely be there on Monday. "If we go to a house and the child is jumping for joy because their teacher showed up at their house," Mitchell said, "they're probably going to show up." 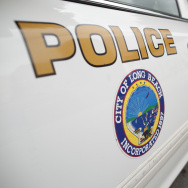 KPCC's Rina Palta contributed reporting to this story. High school teacher Lisa Alva Becker has gotten used to the standard drill in an English class: select a text or topic, have students read and study it, assign a final project for the unit, grade it and move on. "This has not changed in a thousand years," said Alva Becker, laughing. Alva Becker said her course grades end up giving out follow a standard Bell curve. A handful of students receive A's. 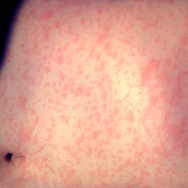 Most receive B's or C's. Perhaps one in ten of her students will get a "Not Yet" — Alva Becker's preferred nomenclature for the grade more commonly known as an F.
But Alva Becker (who, by the way, made an unsuccessful bid for L.A. school board last March) has come to see the standard grading structure for the English class as a problem. "There's no room for growth," she explained. "You have the two ends of the bell curve that don't respond to that." 'A'-caliber students, Alva Becker said, rarely fail to exceed grade-level standards, but also rarely push their own limits. But "Not Yet" kids often face the opposite problem: they are less likely to even turn in assignments because they'd prefer to mask a serious academic deficit that has accumulated over time than reveal it to Alva Becker, the teacher. "I wanted to find a way to challenge both ends of the spectrum — and all the kids in the middle — but particularly the straight-A students and the straight-fail students." So this year, Alva Becker will debut her solution in her tenth grade Honors English class at Bravo Medical Magnet High School: a brand new grading system. For starters, a solid final project in any given unit will be worth a maximum grade of a C.
To earn any higher, students will have to submit "supplemental tasks": a thoughtfully-researched paper or presentation in response to a central theme of the topic they're studying. For an A, a student would have to turn in two such supplemental tasks — and one of those two must be a credibly-sourced analysis of data related to the central topic. "I wanted to find a way to engage them by grading on growth and then offering a challenge," Alva Becker said, "and grading how well a student meets any given challenge." That's not all: Alva Becker also plans to sort kids into carefully-crafted groups of four — a mix of high-achievers and students who have been more prone to struggle. Expanding on some experiments she began with group work last school year, Alva Becker will ask her students this year to assign grades for themselves and each of their peers as group members. Group work, she explained, will be a key part of her course. These group-dictated scores will be perhaps as much as 30 percent of a student's overall grade, Alva Becker said — meaning high-achieving students have a vested interest in helping "Not Yet" kids show gains. "Last year, my tenth graders … were very understanding of the kid with the extenuating circumstance but with a real desire to learn and grow," she said. "They were equally intolerant of students who were riding on their coattails." Group members also may assist each other in crafting their supplemental tasks, Alva Becker said — and these peer-refined papers, she hopes, will be easier and less time-consuming to grade. Alva Becker is keenly aware of the possible pitfalls: of parents worried the extra work could damage their child's GPA, for instance, or that all the extra assignments will massively expand her paper-grading workload. 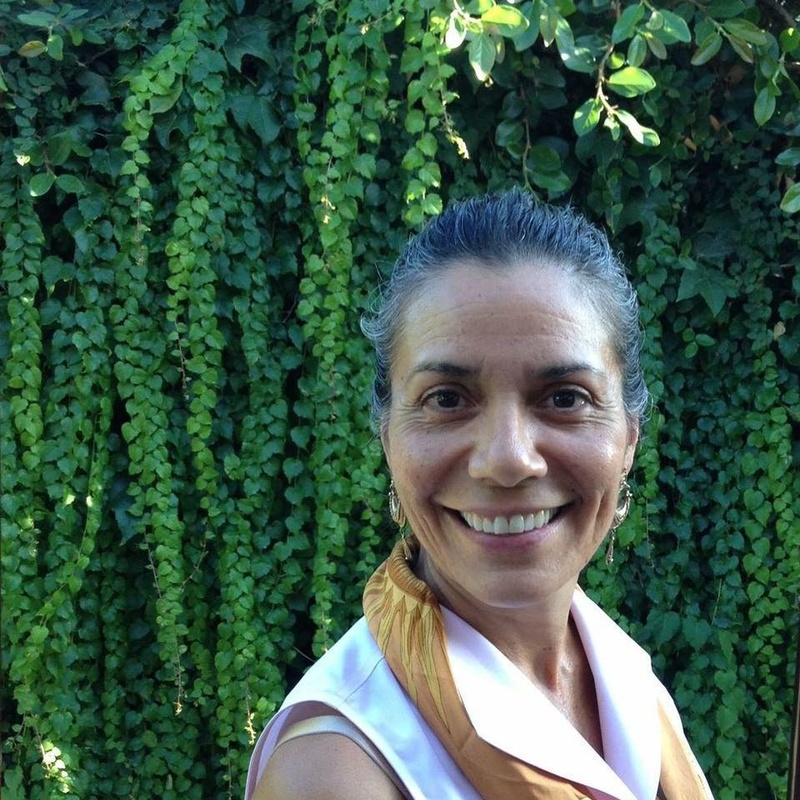 Lisa Alva, a teacher at Bravo Medical Magnet High School in Boyle Heights. Alva Becker expects glitches, she said, but she's also willing to work through them. "If maybe I just become overwhelmed and don't have time to pursue this," she said, "then I'm not ashamed to say I'm just going back to grading everything on my own and we'll take away these supplemental tasks— I don’t know, I’m willing to grow and change with it. "But I really feel strongly," she continued, "because students are not graduating from high school with the basic skills they need to be successful … and when they get to college and they've never done extensive research or written anything longer than a five-paragraph essay, that's the part that I want to dig into. That's the part I want to address." Alva Becker said she's told her department chair and two teacher colleagues about her planned changes to her grading scale. They all expressed interest in seeing how the process would work. She said eventually her supervising assistant principal will weigh in on the process; she's being formally evaluated this year. "It's going to be an adventure," Alva Becker said. "I can't deny that."